Since we're going to be living in this frozen tundra for a while, let's highlight another pair of boots you need right now. We're actually more familiar with their amazing sandals but I'm taking this time to introduce you to one of their great snow boots. 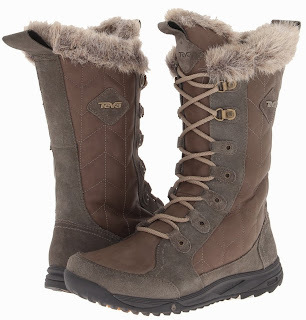 The Teva Lenawee Leather WP Snow Boots boasts waterproof leather and synthetic upper, seam-sealed waterproof construction features the Teva™ T.I.D.E Seal waterproof membrane to protect you from the elements, Teva's versatile MXT platform for freedom of movement, a Bungee lacing system for a snug fit and easy pull on and off, a faux fur interior lining, rubber bumper for added protection from debris, nylon shank at midfoot for added stability, a white Spider™ Rubber sole which stays soft and flexible in freezing temperatures, easily gripping the surface for excellent traction, a Mush® Infused insole which offers the same incredible comfort as a Teva flip flop and a very comfortable 1" heel. So ladies, if you are without any real snow boots, please add this to your shopping list pronto because we have a few more days of this Antarctic weather.